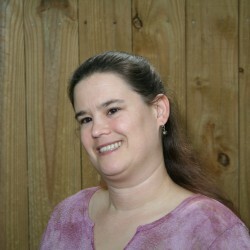 Ferradiddledumday: An Appalachian Version of Rumpelstiltskin - Writing and Reading and Editing, O My! 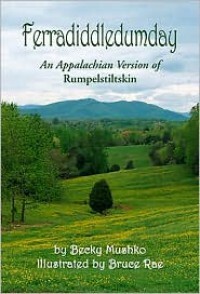 This book is billed as "An Appalachian Version of Rumplestiltskin", and fills that description very well indeed. From the cover shot of rolling hills to the rough illustrations and the language used ("Oh, Pa ... Surely they'd not do that. "), this book takes the reader into what is, for me at least, a whole new world. I found this book well-crafted, with deft touches like marking the passing of time by calling out what local plants are in bloom throughout the story. While the basic story remains the same underneath, it's been given a very attractive and interesting new coat. It is obviously designed to be read aloud, and given that I've heard the author read in public before, I couldn't help hearing her rich voice in my head throughout. It made the book a very fun read, and I suspect parents who like reading to their kids, or kids that like hearing books read to them, will love this remake as much, if not more than, the original.